HUNTINGTON, W.Va. – Marshall University’s cast of “Dead Man Walking” will take the stage beginning Wednesday, Feb. 23, as part of a theatre project designed to raise awareness and replace apathy regarding the death penalty. 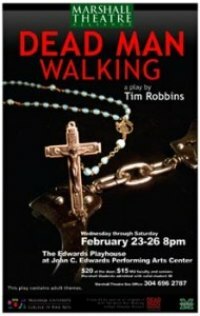 Marshall’s Theatre Alliance will perform “Dead Man Walking” at 8 p.m. Wednesday, Feb. 23, through Saturday, Feb. 26, in the Joan C. Edwards Playhouse on the Huntington campus. At 3:30 p.m. Friday, Feb. 25, the Department of Theatre will host a roundtable discussion about the death penalty in the Francis-Booth Experimental Theatre. The play, written by actor Tim Robbins in 2002, is based on the experiences of Sister Helen Prejean as the spiritual advisor of a death row inmate at the Louisiana State Penitentiary in Angola, La. Rather than producing the play professionally, Robbins offered it to schools and colleges across the United States as part of a project designed to foster discourse and discussion about the death penalty. The project, titled “The Dead Man Walking School Theatre Project,” is managed by the Death Penalty Discourse Center (www.dpdiscourse.org), where Prejean now bases her work. Participants in the Feb. 25 roundtable include Dr. Shari Clarke, vice president of multicultural affairs at Marshall University; Rabbi James Cohn from Temple Israel in Charleston, W.Va.; Frank Crabtree, head of the American Civil Liberties Union for West Virginia; and Dr. Charles Gallmeier, professor of sociology at Indiana University Northwest. The discussion will be led by Steve Crimaldi, national coordinator of the Dead Man Walking School Theatre Project.